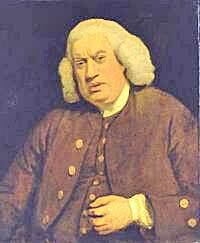 Samuel Johnson, poet, essayist and lexicographer, was born in Litchfield, son of a book seller, who himself was born in Great Cubley in Derbyshire. Johnson lived and worked in Litchfield for a time as a teacher and a bookseller and married Mrs Elisabeth Porter, who was 20 years his senior, in St Werburghs Church, Derby, in 1735. He moved to London 2 years later and earned some reknown as a prose moralist, notably with his periodical essays 'The Rambler' and The idler', and later with his philosophical romance 'The Prince of Abysinia, later known as Rasselas. Johnson's most famous work was the 'Dictionary of the English Language', published in 1755, which remained without rivel until the creation of the Oxford Englidh Dictionary, over a hundred years later. Johnson wrote the definition of over 40,000 words illustrating them with 114,000 quotations from every field of learning. With James Boswell, who was later to become his biographer, he travelled in Scotland and published his observation's in 'A Journey to the Western Islands of Scotland'. It has been suggested that he was in person slovenly, in manner abrupt and even rude, driven by fears of insanity and damnation, suffering from hypochondria, but he emerges from Boswell's Life as a man of essential kindness, generosity, and sociability. His biographical essays of English poets were published in 1781 as 'The Live's of the Poets'. He visited Derbyshire on many ocassions, sometimes staying with his friend Dr John Taylor who lived at 'the Mansion' in Church Street, Ashbourne. He also stayed at numerous inn's in the county. He died in 1784 and was burried at Westminster Abbey having been one of the outstanding figures of 18th century life and letters.